Here in South Daytona, FL, Dr. Sean Bannan and our team believe in the power of a healthy set of teeth. Truly great dental care shouldn’t only create positive results for your smile – it should benefit the rest of your body as well! With our wide variety of available preventive and restorative services, we’re confident that we can help boost the quality of your life while also revitalizing your oral health. 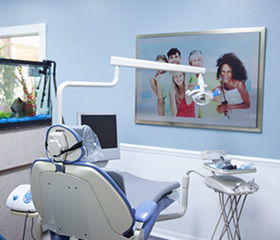 Only the best materials can be found here at Water’s Edge Dental, and we offer patients the same treatment options that we’d recommend for ourselves or our families. Of course, it’s not all about fancy equipment or a lengthy menu of dental services. For Dr. Bannan, forming close relationships with each of our patients is also very important. Our team will be sure to greet you by name every time you come in, send you special notes for birthdays and anniversaries, and check up on you anytime you’ve undergone complex or lengthy treatment. It’s these little touches that can truly make a difference in how you and your family approach dental care. Our office is open Mondays through Thursdays from 8:00 a.m. - 5:00 p.m. Additionally, Dr. Bannan is available by phone 24/7 if patients need to contact him after hours. Your comfort and satisfaction are our number one priority! Contact Water’s Edge Dental today to schedule an appointment today. Located in South Daytona, FL, our team also serves the areas of Port Orange, Daytona Beach, Holly Hill, Ormond Beach, Edgewater, and beyond.